I have many strange automotive fetishes, and I’ve long given up trying to understand or justify them. One of these obsessions has to do with novel trunk ideas, and I think I may have an idea for something I don’t believe I’ve seen before. It’s an idea that combines what I think may be the best of a trunk and a hatch, and I think has only one really significant possible drawback. My fellow gearheads, allow me to introduce the Thatchback. While there have been cars that have very cleverly combined benefits of hatch and trunk, like the remarkable Skoda TwinDoor system, the Thatchback is a bit different, taking an arguably cruder approach. 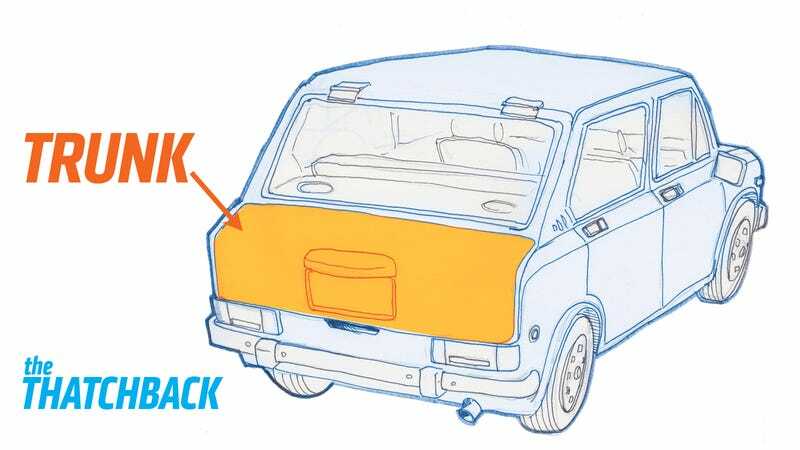 Instead of providing two separate methods of accessing the same cargo volume, a Thatchback simply grafts a smallish trunk onto a conventional hatchback door. The reason for this is to get the security benefits of a trunk (non-visible cargo, no vulnerable windows allowing access) with the benefits of a hatchback (great access, more flexibility, etc.) combined into one unit. The way I’m imagining this working is essentially a hatch door with an integrated enclosed trunk area. When you use the latch for the trunk, just the trunk lid opens, giving you access to the separate, secure trunk storage area. When you use the hatch latch (natch), the whole hatch opens like a conventional liftback, trunk area included, and hopefully a good strong hatch assist strut can overcome any excess weight from whatever you may have in the trunk area. That weight I think is the biggest drawback, but I think with the right assists (power, pneumatic, etc) it could be mitigated. Also, it’s worth noting that this same concept would work just fine on a sideways-swing-out door, too, which would eliminate any hatch weight and support issues. It could be possible, even, to have the in-door trunk have an openable inner door, in situations where you just needed the maximum hatch area and no enclosed trunk storage. Even though the name implies this would be a modification of a hatchback, there’s no reason anything with an opening rear couldn’t use it as well: wagons, for example, or even truck tailgates (where it could provide important secure storage for tools and other equipment), cargo vans (easy access to often-used tools and equipment from the rear of the vehicle, without having to root through a whole van), and possibly even providing smallish but useful storage areas for rear- and mid-engine cars without provisions for a frunk. So, what do we think, here? I think there’s some reasons for this to exist. I mean, maybe not many, but perhaps some bold automaker could include a Thatchback configuration and get just that extra bit of differentiation they so dearly crave. Then again, I could be an idiot. I get that a lot.